Great for rectangular lots, the Terrell lives much larger than its cottage exterior appears. Immediately through the foyer of this house plan is the formal dining and great room. A single column and tray ceiling grant architectural interest to the dining room, while the fireplace, rear porch access and overhead balcony provide stunning details to the great room. Accessing the rear porch and gracefully flowing into the kitchen, this house plan's great room is the perfect entertaining space. The master suite is truly pampering. Located on the first floor, it is tucked away for privacy and includes an indulging bathroom with a garden tub, separate shower with seat and twin vanities. 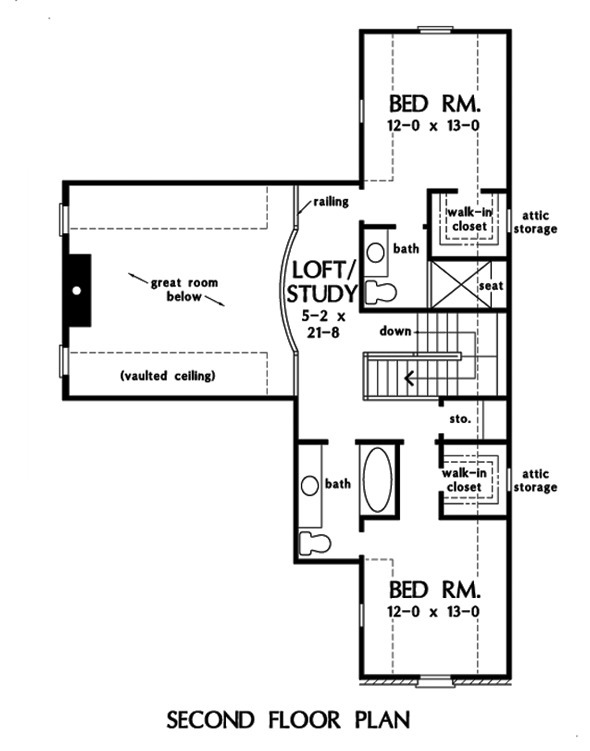 The kitchen and utility room complete the first floor of this house plan. The second level includes two secondary bedrooms, each with walk-in closet and private bath, as well as a loft/study that overlooks the great room. 1st Floor: 1280 Sq. Ft.
House Dimensions: 43' 6" x 55' 8"
Great Room: 18' 10" x 17' 8"
Master Bedroom: 12' 0" x 16' 0"
Foyer : 5' 0" x 7' 0" x 9' 0"
Great Room (Vaulted): 18' 10" x 17' 8" x 18' 0"
Garage : 23' 0" x 22' 10" x 0' 0"
Garage Storage : 6' 0" x 3' 4" x 0' 0"
Master Bedroom : 12' 0" x 16' 0" x 9' 0"
Porch - Front : 18' 10" x 6' 0" x 9' 6"
Porch - Rear : 19' 4" x 7' 0" x 9' 6"
Loft / Study : 5' 2" x 21' 4" x 8' 0"
Kitchen : 11' 0" x 10' 4" x 9' 0"